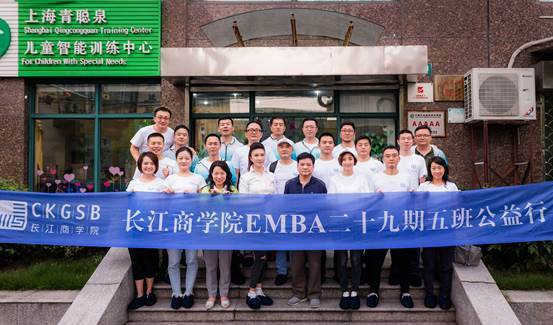 On the afternoon of August 25, a group of about 30 students and their children from class 5, EMBA 29 of Cheung Kong Graduate School of Business (CKGSB) visited the Shanghai Qing Cong Quan (QCQ) Training Center for Children with Special Needs and donated 192,000 yuan to the center through SSCLF – Safety for Mothers and Infants Public Welfare Fund, in support of the expanded communication project for autistic children. The project aims to promote teachers and parents communicate with autistic children touching their rich and delicate inner world through new technical means while parents will develop more confidence and hope for their children with autism. 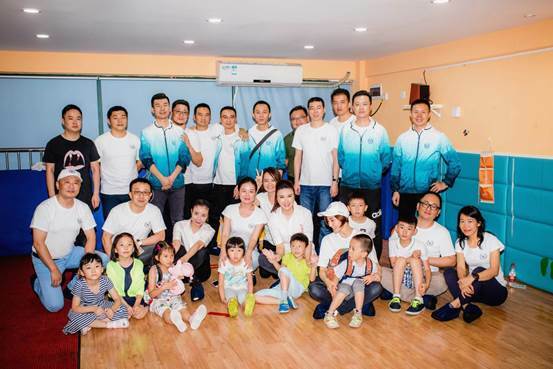 Ms. Chen Jie, founder and principal of Shanghai Qing Cong Quan (QCQ) Training Center for Children with Special Needs, briefed the guests on the center and project situation and led them to visit the center’s current operation environment. SSCLF acting secretary general Jia Yong made a speech at the event, he said the Shanghai Soong Ching Ling Foundation would oversee the effective implementation of the donated project, and hoped that the CKGSB students would be able to continuously spread the love and kindness seeds, so that more people could understand this special group, and provide autistic children with the help they need. SSCLF-Safety for Mothers and Infants Public Welfare Fund Chairman Qiu Haining, Love Ambassador Zhang Yushan and Liu Shiqing, a representative of class 5, EMBA29 of CKGSB, accepted the ink painting works created by the autistic children of the Qing Cong Quan Center. They also watched a class of sports coordination designed for autistic children. The visitors had a more clear and more concrete understanding of this special and unfamiliar group.